My fellow elven commanders!!! I've not see yet a thread dedicated to discuss what Strategies, Tactics and Combos were introduced with the new book EOT: Khaine. a bit too early as the book even isn't out? And if the above statement is true then people won't have played any games or much games at all. A Wood Elf Lord/Hero with Moonstone + Any dangerous HE/DE unit can port in and be quite dangerous. Blood Shrine Bound Spell on a unit of Wild Riders gives each model 7 attacks on the charge (1 base, 1 Devastating Charge, 2 for Frenzy, 1 base mount, 2 for mount Frenzy). High Elf Mage + Either Sisters or Warlocks = fast moving 3+ ward save bunker. Still a 3+ ward fast moving bunker. If I have to choose between my mage never being engaged and sticking him in a combat block of PG and both getting a 3+ ward, I'll stick to the never being engaged part. Just dark elves with frosties and BotWD really. With that in mind, I plan on taking a Loremaster so that I have 56 spells and either power scroll or book of hoeth then stick him in some swordmasters, perhaps with a cauldron of blood. If you use the Host of the Eternity King you would have Martial AND Murderous Prowess, 3 attacks per model in the front rank (frenzy) and throw in the banner of the world dragon and you have a terrifying unit IMO. That is the sound of Warhammer breaking. Not really. One casting of Dwellers at the unit and it's effectiveness drops drastically. 2 Castings (remember you can try to spam spells now if you successfully cast it previously) and it's pretty much done for. BotWD does nothing against Dwellers. Plus it's Swordmasters... you can still shoot them to death crazy easily. 4A sword masters with double prowess... before spells. Again. This still runs into the whole it's Swordmasters issue. I know people desperately want to make Swordmasters good, but giving them more attacks isn't what does it. Protection is what does it. White Lions with 3 attacks each in the above combo sounds WAY more dangerous because of the fact that they'll actually arrive in one piece. And the solution to that shooting that you're worried about could be the 8 bolt throwers you're packing. If there's no shooting threat, sword masters get pretty stupid, pretty fast with a couldron and witchbrew. That said, lions are still the safer bet. Either way Phoenix guard are clearly the best unit to accompany a the cauldron of blood, especially if the hag has war cry, take or leave the anointed on foot. 15 Dark shards might be the best small arms shooting unit in the game with martial prowess, and shields aren't a bad investment. Using all three books you can build a pretty fearsome, high strength infantry list. Which is actually pretty potent when backed up with high magic, and warlocks to supplement the lore. Would add that Shadow compliments that infantry list as well. With Malekith (with the addition of his innate bonuses to both murderous prowess and martial prowess) being a massive boost to infantry lists that can stay close to him. Warhammer´s fun. That army will shoot anything off the tabletop. With BOTWD + High Magic counters defensively, not much can touch it. I don't agree multiple 3++ from chaos and DP can walk through it without any difficulty at all... Not to mention the chariots, skullcannons and scouting harpies. I've essentially seen this army already get walked through locally, one game it lost because the player lost the role off for first turn against shooty avoidace Dark elves, then it got 20-0 by Nascar, and game one drew MSU Daemons. The other player using the army did better but he played HEs twice as soon as he played chaos he lost to the DP just landing in the middle of the waywatchers and casting choir and then proceeding to push 3 skullcrushers through the rest of the army. While it might not be the perfect combination given the possibilities, that list is insanely strong. Wood Elves, like Lizardmen, are extremely hard to play well and thus it´s easy to have a false sense of how powerful they can really be. As for WoC, it´s a common misconception that these are a bad matchup for Wood Elves. I know 2-3 extremely skilled Wood Elf players and uncomped the matchup vs WoC is not even funny. Withering, Arcane Unforging, Walk and Hand just kill WoC so badly, add Mindrazor with Book of Hoeth on the L4 as well and, yeah. Daemon Princes frequently go down T1, after all Waywatchers and Waystalkers scout so you just place them 40" away, march up and shoot them to kingdom come before they get to move. 3++ lords are likely the most painful, but in reality you are unlikely to see more than one of them as the second is more likely on a Sorcerer or BSB. Again, Arcane is powerful and Mindrazor risky. I never understood why all the hate towards Swordmasters.. They are an amazing unit, I take them to every game I have been taking them in 20 (7Wx3D) with a Loremaster and Banner of the World Dragon at 1000 Points and up, and they have done amazing every single time, and in Siege games they are the reason I win, People underestimate that extra Attack and WS base a lot, and best part is they are less comp points then both White Lions and Phoenix Guard! I have never lost the whole unit (Lore of Life) and they have taken out seral hundred points each game, and in triumph & Treachery they win games on their own.. The problem with SM is not that they aren't good, it's more that they are mainly very good vs things most HE armies don't have a lot of trouble with. I remember someone earlier doing a statistical comparison of SM vs WL in terms of killyness. Against T3 5+ armour models (or worse) or stuff with wards, SM perform better. Against other stuff, WL are just as good or better. And most HE armies struggle vs high armoured opponents more then vs t3 5+ armour stuff. And the added protection vs shooting WL get means that more of them will survive and get into combat against a lot of opponents. A smart opponent will know that a big unit of SM is not something you want to fight, but also that it dies vs shooting pretty fast. They are a nice target for HE archers for instance. Last thing is that in bigger units the advantage SM has, being the 1 extra attack matters less and less. A unit of 7 will have double the attacks of a unit of WL. A unit of 21 (3x7) will only have 33% more attacks. And if you decide to buff them with an extra attack (so 3 in the front rank for SM and 2 for WL), then the SM only have 25% more attacks. I think if the arrow deflection were back like it was in 5th, with -1 to hit, it would go a decent way to making them on par with Lions. Still not as survivable, but that's why they each cost what they do. So I'm curious, has anybody thought about a Light Council type of list? Since Banishment can now be spammed, we can have 50% lords and 50% heroes, getting a bunch of light wizards isn't hard. Yeah, Im considering 4 lvl1 light mage/sorceress in a cavbus. The problem im having with light council is that I cant find a good place to put them other than with a cavbus(cany cast once in combat) or with woodelf skirmishers. Why not with the fast cav casting bunker? They'd all have to wood elf light wizards though. Well, I think he's trying to get BoH in there, which needs a high elf. I think it would be fine though. They wouldn't be fast cav anymore (since our steeds can't figure out how to not run into trees), and no forest strider, but it's probably fine. 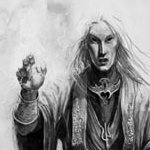 Frankly, given that using the Khaine Magic Rules is mandatory when using armies from that book, the best caster is, hands down, the Sorceress because of the dagger. Why? easy: The dagger allows you to bypass the limit on dice thrown, helping a whole lot to get those 15+ ET spells out, regardless of the 1D6. Furthermore, these mechanics punish heavily dispels, too, so you don't need to go over the top. Heck, you could take lore of Undead, summon a unit of zombies, move into the unit in your next turn, and start spamming spells. You just out-Nagashed Nagash. BSB with BotWD for extra cheese and protection from miscasts. Frankly, given that using the Khaine Magic Rules is mandatory when using armies from that book, the best caster is, hands down, the Sorceress because of the dagger. Why? easy: The dagger allows you to bypass the limit on dice thrown, helping a whole lot to get those 15+ ET spells out, regardless of the 1D6. Actually, I think it doesn't. End Times magic rules specify that items that grant extra dice to spells being cast can be used but they can never take the number of dice higher then the number rolled on the D6 for the amount of PD. So when you roll a 4 on the D6 for the amount of PD, you can use 3 pool dice and a sac-dagger dice. But you can't use 4 pool dice and a 5th you get from the dagger. "Any special rules or magic items that modify the number of power dice used to cast a spell, will work just as they would have done previously; the only change is that the maximum number of dice you can choose is changed from 6 to the roll of a D6"
I admit I don't know by memory the exact wording of the dagger, nor I have a copy with me of the DE army book, but as long as the item itself doesn't cap at 6 max, it should work. The cap only applies to dice taken from the pool, not from other sources. I just checked and the item doesn't specify any cap. But after close examination, I'm pretty convinced that you can only make one 'successful' sacrifice per casting attempt. If you don't make the 4+ roll and the sacrifice fails, you can sacrifice again until it does, but once a successful sacrifice is made the wording of the rules do not allow for any more on that casting attempt. Therefore you are never going to get more than one extra power dice on any particular cast. I was playing yesterday with repeated successful sacrifices with the dagger and I felt it was too overpowered - I was getting off the Metal End Times spell every turn. But if only one successful sacrifice per casting attempt is allowed, I'd say it is fine - bargain for the points in End Times, but no game breaker. Its main use, like book of hoeth, will be to keep low dice spam chains going, as well as a *little* extra help to get those big spells. But I think Shades is right and you would be allowed one extra dice over the D6 casting limit. Last edited by Ladril Caledor on Tue Dec 09, 2014 7:28 pm, edited 1 time in total.